Happy Tuesday, my friends! I want to let you in on a little secret. If you live anywhere near Philadelphia, you must make a special trip to the most interesting little shop around town. It also happens to be the best place to buy estate jewelry and baby rattles! My son and I went to this store about a year ago. Knowing how much I love antiques and shiny things he knew I would love it! And of course I do! It’s called First Penn Coin & Jewelry located at 25 Easton Road in Warrington, PA. They specialize in estate jewelry, certified diamonds and custom designs. They will even custom make an engagement or wedding ring just for you! Need a repair or estimate? They do that as well! For me, more exciting than jewelry is you never know what they may have! For instance, this little store is where I bought this beautiful chandelier. 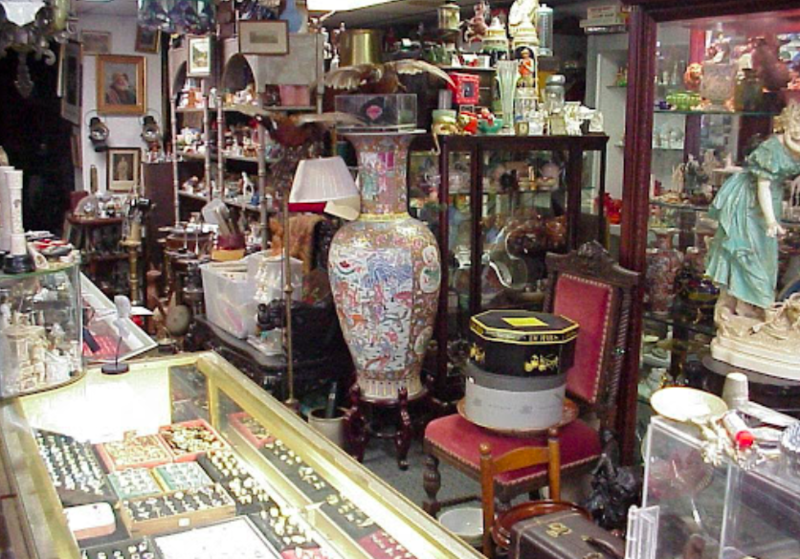 They have antique lighting, chandeliers, paintings, watches, silver tea sets, etc. I’m sure the inventory changes daily. This chandelier was $150 which I thought was a fairly good price even though it was missing a lot of the crystals. More importantly it matches one in my collection. To read more about what I did with this chandelier read more here: Happy Moving Gift to Me…. It’s interesting because when you go visit the store, you can’t just walk right in. They buzz you in. I’m sure it’s all about security and safety and if you look at their jewelry cases, you’ll see why. This is a little sampling of the store from their website. Literally you could spend hours in here just looking at all of the goodies! Here is another similar rattle that has been “used” a bit. If you buy antique baby rattles often they are tarnished and dirty from age. To gently clean the rattles you can use a mix of fresh lemon juice and baking soda and they clean up nicely! Naturally you wouldn’t want to use a silver polish or cleaner for a baby rattle. And here are some rattles all cleaned up! Aren’t they sweet? To find more tips on antique rattles you can read more here: Antique Baby Rattles! I enjoy giving unique gifts and particularly keepsakes. If you are in the market for such lovely and long lasting gifts, you should check out First Penn Coins and Jewelry! They have a huge selection of watches, brooches and necklaces, too! They will buzz you in and you can spend at least a fun hour perusing their vast inventory of beautiful estate jewelry. This place is amazing! Don’t think because they sell antiques and vintage jewelry it is inexpensive, but they are very reasonable and will definitely work with you on pricing. For instance, if you are looking for a one carat diamond, they can work with you on the three C’s and find the perfect stone for you! (Cut, Carat, Clarity) And they will design a custom ring just for you or your loved one. Or, if you like, or you can choose a gorgeous, one of a kind vintage ring. Also, the owner and staff are top notch, so knowledgable and friendly! I highly recommend this shop! With graduations and holidays right around the corner, check out First Penn Coins and Jewelry and surprise your favorite person with a one of a kind gift they will treasure always!